The Hindenburg Line was a system of defences built by the German Army during the winter of 1916/17. They officially called it the Siegfried Stellung (not to be confused with the Siegfriend Line) but the British believed it was called the Hindenburg Stellung – and the name Hindenburg Line adopted. 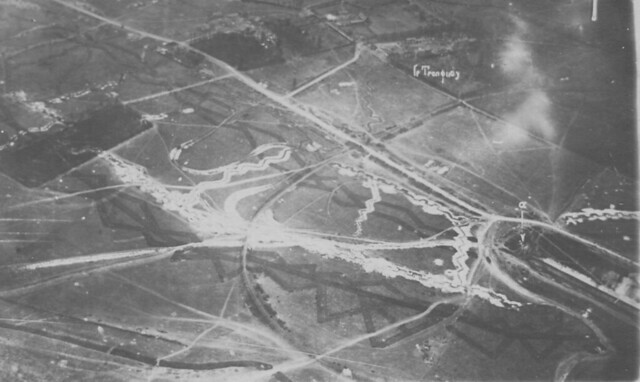 This image shows the Hindenburg Line around the village of Le Tronquoy on the Aisne; as yet untouched by shell fire. A sense of the depth of the trenches can be seen and the thick black marks are the belts of barbed wire, showing what a formidable obstacle they were. This section of the Hindenburg Line did not see serious fighting until the final stage of the war when it was breached in October 1918. This entry was posted on 09/05/2012 by sommecourt. It was filed under Aisne, France, Great War, Hindenburg Line, Western Front, WW1 and was tagged with 1917, Aerial Photo, Aisne, Hindenburg Line, Le Tronquoy, Trenches, WW1.